The premium cigar industry survived a wild ride in the final years of the passing century. For the year 2000, expect the evolution of brand dominance to continue its agglomeration into the hands of fewer - but stronger - players. At the end of the 20th Century, there were many baseball experts who felt that Ty Cobb was the greatest player in history: Highest career batting average, a hit total that stood unchallenged for decades, the number of stolen bases, and so on. The public? They'll say Babe Ruth, the man who brought the big stick to baseball, whose signature was the booming home run, and whose primary team, the New York Yankees, became dominant because of it. So it is with cigars. The big boys - you know who they are - continued their aggressive drive toward reclaiming their pre-boom dominance during 1999. The "single-base hitters" who remain are finding their ability to obtain shelf space more and more difficult as the "sluggers" continue to bring new players to the game. General Cigar, already the proud owner of the top two brands in the country - Macanudo and Partagas - continued to put pressure on smaller brands with two new introductions: Macanudo Maduro and Partagas Serie S. True, there have been maduro shapes of Macanudo before, but they were not well known as that brand became celebrated for its perfect draw and mild, even flavor. So, why not bring out a special maduro series to offer a complete variety of tastes within a single brand? Mild for Macanudo, medium to full for Macanudo Robust, full-bodied but slightly sweet for Macanudo Maduro, and a subtle richness in the Macanudo Vintage line. Now a smoker need never leave the Macanudo brand to find what he or she wants, and the retailer will have to respond by stocking all four versions of the brand. Smart on General's part, but the hissing sound you hear is from small producers whose shelf space is turning into thin air. This is especially true when General's size and reach across the nation allows it to organize its unique in-store tastings of these new cigars just in advance of the holiday season. Like Macanudo Robust, the tastings of Macanudo Maduro and the shaped cigars of the Partagas Serie S get these cigars "into the mouths of the smoker" as one salesman put it, and get the opportunity to make an impression that smaller brands cannot compete with. In the compilation of the 2000 edition of the Perelman's Pocket Cyclopedia of Cigars and its trade companion, the December 1999 edition of the Perelman's Pocket Cigar & Pipe Finder, we finally noted a serious decline in the number of brands available in national distribution. Where we had listed 1,448 brands in the 1999 edition of the Pocket Cyclopedia, this year's edition showed the first decline ever in our six years, down to 1,222. That's still a lot of brands, but consider the well-known names which are no longer offered for national sale: Evita, Habana Gold, Havana King, Juan y Ramon, Macarena, Peter Stokkebye, Robali, and Tamboril, among others. We did find 178 new brands introduced during 1999, but a remarkable 386 brands exited the market, including a flock of brands which were little noticed and will not be missed. There are numerous small brands which continue to make an impact, thanks to their quality - sometimes a predicament arises due to limited production, which keeps wanted brands off of retailer's shelves due to inadequate inventories. These are brands which have gained respect and continue to flourish such as Bahia, Cupido, and the amazing rise of Nick Perdomo and his endlessly inventive lines of cigars. Perdomo's ascent can be attributed to a combination of a keen eye for publicity, an even keener sense of where the market for niche cigars is going, and the production of cigars which look good, smell good, and have real taste to them. When the rage was fat cigars, Perdomo introduced Inmenso with two shapes of 70-ring each. When even a robusto takes too long to smoke, Perdomo was ready with his Cuban Bullet series, featuring a four-inch by 54 ring perfecto. And Perdomo guessed right by leading the field in the revival of the box-pressed shape with his La Tradicion Cabinet Series Perdomo Reserve in 1998 and 1999's Perdomo2 line. Good insight, inviting packaging and the production of well-made, robust-tasting cigars has made Perdomo a newcomer to be watched carefully, either as an emerging major player, or as a candidate to be bought by a larger firm. Already, successful mid-level or newly-minted boomtime firms have been absorbed by larger players who are getting ready for a major battle over market share in the near future. At the time of the RTDA trade show in Las Vegas last July, the one to watch was Swedish Match. Although it had steadily increased the profile of its Indonesian-made Montague premium brand and several well-known machine-made brands, two acquisitions made big news. Swedish Match acquired General Cigar's machine-made business (including Garcia y Vega, White Owl, and Tiparillo), and then purchased El Credito Cigars of Miami and its U.S. and Dominican factories that produce La Gloria Cubana, El Rico Habano, and La Hoya Selecta. But this action paled beside the merger of Tabacalera de Espana with Seita S.A., owner of Consolidated Cigar Corp., which was announced weeks later. After having essentially no presence in the U.S. market just three years ago, Tabacalera - already the leading importer of Cuban cigars in the world - acquired Hollco-Rohr, Havatampa, and now, Consolidated. 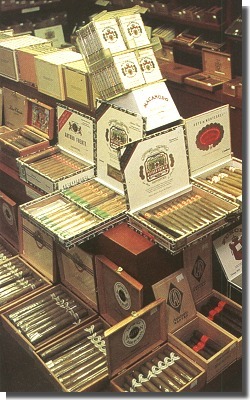 The combined company - known now as Altadis - not only owns significant shares of the premium and machine-made markets in this country, but also the U.S. rights to a boatload of historic Cuban trademarks, including H. Upmann, Henry Clay, Montecristo, Por Larranaga, Quintero, Romeo y Julieta, and Saint Luis Rey. Only General Cigar - owner of the Cohiba, Partagas, Hoyo de Monterrey, Punch brands domestically - even comes close to this aggregation of trademarks . In all, the Consolidated-Hollco Rorh-Havatampa acquisitions makes Altadis the largest company in the U.S. in terms of brands owned, with 74. Lew Rothman's Cigars by Santa Clara is next at 58, some of which are licenses for trademarks owned by other manufacturers. Swisher International follows at 33 brands, and General Cigar is fourth with 30. Almost unnoticed was the distribution agreement for Juan Clemente cigars by Davidoff of Geneva. This high quality brand has been underrated of late, but may be in the right hands for a significant push in the near future. Davidoff's program for this brand will be interesting to observe. Despite all the hub-bub at the wholesale level, the retail tobacco business has seemed immune to time. Although the days of the corner cigar store are gone, it still remains a face-to-face business where the smell and feel of cigars cannot be duplicated. In 1999, some brands which seemed to recede from the retail cigar scene, found hot markets on the Internet and serve a growing clientele without ever shipping to a store. The breadth of choices and availability to order on-line wasn't much discussed at the RTDA, but it is coming, despite the introduction of bills in Congress to ban mail-order or Internet sales of cigars. In an increasingly fractured market, even ads in the glossy cigar magazines are no sure way of attracting enough attention to make a difference. Building brand interest and loyalty can continue through ads and shelf space in stores, or could be built on a new model of alternative communications (on-line) and special events at selected locations, perhaps in conjunction with larger retailers such as wine or luxury goods stores. Or brands will eschew the national scene and build a strong base of support in a specific region, establishing the brand's "home" and only then expanding region by region, using a long-term strategy instead of an all-at-once approach. For 2000, interest in on-line sales will grow and the tightening of the number of brands available will continue. By the end of 2000, we may see the number of available brands dip below 1,000 for the first time since early 1996, but they will be mostly in the hands of companies who are well enough capitalized to be able to finance a "home run" brand even in the midst of the still-cluttered brand environment. After all, the public is always ready for the next Babe Ruth.